Located 300 km north of Brisbane, Hervey Bay can be reached in just three and a half hours by car making it ideal for extended stays or day trips. Renowned for its fantastic whale watching, Hervey Bay is one of the Fraser Coast's most recognised marine playgrounds. Touted as the gateway to the World Heritage listed Fraser Island, Hervey Bay is an aquatic wonderland filled with pristine beaches, fantastic swimming, abundant fishing and plenty of adventure with access to a number of offshore islands and unique wildlife. Once one of Australia's busiest immigration ports, Maryborough is now a quiet coastal town three hours from Brisbane steeped in rich history. The Wharf Street Precinct and classic housing in Maryborough has preserved much of the era and makes for a striking city. The tree-lined streets add to Maryborough's charm however old meets new as modern conveniences are still present. Within just minutes you will discover fertile farmlands, sun kissed beaches, lush rainforests, tropical islands and national parks abounds with native flora and fauna. 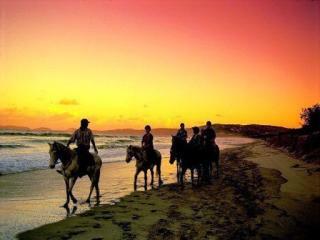 Rainbow Beach is the ultimate holiday destination for outdoor adventure. With fantastic surf beaches and world class scuba diving there is so much to see and experience. Try your hand at paragliding or hang-gliding, spot dolphins, whales, manta rays and turtles, go skydiving, sea kayaking, horse or camel riding or explore the National Parks in a hire 4WD and visit amazing fishing spots. Rainbow Beach also has a range of attractions including the coloured sands of Carlo Sandblow as well as Double Island Point Lighthouse, the Cooloola National Park, Inskip Point and Wolf Rock. Fraser Island is a unique part of Australia as it is not only World Heritage listed but is also the largest sand islands in the world. It is also one of very few places on earth where rainforest grows on sand. Brimming with hundreds of species of native flora and fauna both on land and in the surrounding waters, Fraser Island is also renowned for its dingo populations. A fantastic holiday destination for the whole family, Fraser Island features freshwater lakes, flowing creeks, 4WD circuits, scenic walking tracks and beautiful picnic spots.